This is the fourth in a series of 14 posts expanding on Salzman’s forecasts for 2013 in her annual trends report, a program of global communications group Havas Worldwide. This year’s book, What’s Next? 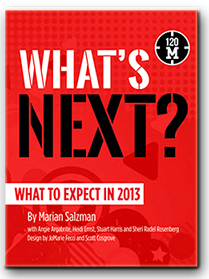 What to Expect in 2013, will be published on 12/12/12 and available at 120MBooks.com. Salzman is CEO of Havas PR North America and an internationally respected trendspotter. "If you live in Greece or Spain or even in parts of the United States, that nasty gurgling sound is the economy going down the drain. The official economy, that is—the one that gets tracked by the accountants and tax officials and economists who feature in the media every day. Amid the many negatives of the financial meltdown of 2007-08, one positive effect is that more people have started thinking harder about money—and not just about their spending and bank balance, but also about money itself. Who would have thought a video rap anthem called “Fear the Boom and Bust,” pitting economists Hayek and Keynes against each other, could get almost 4 million YouTube hits? Until the bust, most people living and working in the mainstream were so used to hearing about “the economy” and living in it, they thought “the economy” was just one thing, just one complex web linking designers, factories, shippers, retailers and consumers around the world through banks and financiers. The official economy isn’t the only one at work; there are other “unofficial” or “informal” economies that don’t get tracked. There’s the gray economy of legal work that’s done off the books for cash to avoid being taxed: home repairs, car repairs, domestic help and the like. And there’s the black economy of totally illegal activities and goods that are traded for cash: drugs, prostitution, stolen goods, smuggled goods and weapons. It’s calculated that the shadow economy in developed countries (OECD and EU) is anywhere from about 8 percent to 28 percent of GDP, while in Latin America and sub-Saharan Africa it’s well over 40 percent. Most people don’t want anything to do with the black economy and they’re leery about the gray economy, too, but they’re also increasingly disenchanted with the official economy. Plus, in the United States, trust in the financial system has fallen steadily; in a recent survey, just 33 percent of people overall trusted banks. As official currencies bounce around, cash gets tighter and people lose faith, more of them will experiment with different ways of trading with each other and paying the bills. Barter trading is one quick and easy solution for people and small businesses with skills, goods and time but limited cash. The trouble is that there are so many different goods and services on offer; how can you find someone who wants what you’re selling, is selling what you want and can agree on a price? Bartering has a new lease on life because of the Internet, which can match buyers and sellers and keep track of their trades. ITEX, for example, has grown into a sophisticated worldwide system where members (businesses or consumers) buy and sell using “trade dollars.” On a bigger scale, the growing trend of B2B barter is handled by organizations such as the International Reciprocal Trade Association; in 2011, more than 400,000 companies worldwide used bartering to earn an estimated $12 billion on unwanted or underused assets. Barter is no longer a quirky, fringe business. Although … comedian Josh Sankey recently traveled overland from New York City to Los Angeles without cash or credit cards. To get what he needed, he hauled a ton and a half of Oscar Mayer bacon to barter. And one of the best instances of bartering is the annual Burning Man festival, where no money is exchanged for everything from massages to burritos. We probably can’t expect any of these to last as long as some of history’s great local currencies—such as the florin from Florence, the ducat from Venice and the thaler from Jáchymov in Bohemia, all of which spread widely and lasted centuries. On the other hand, complementary currencies are still going strong, witnessed by the fact that 2013 will be the year of the Second International Conference on Complementary Currency Systems.